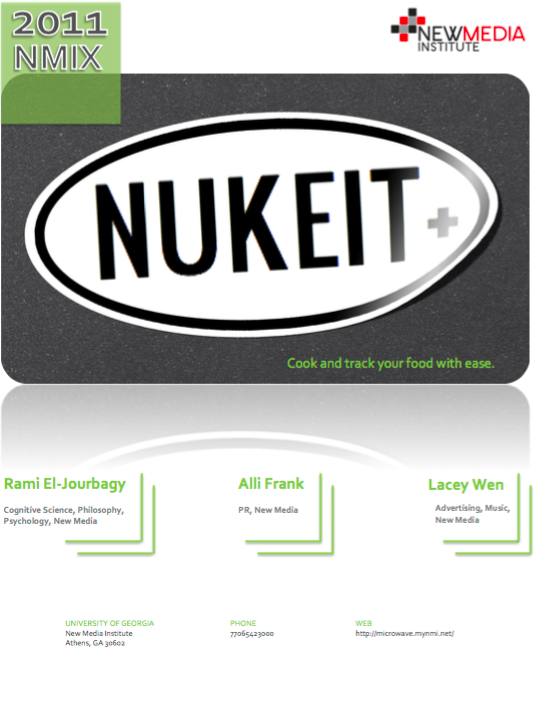 Here at NukeIt+, we want to improve YOUR interaction with the kitchen. The NukeIt+ app will be able to automate your kitchen appliances to an extent, send notifications as items are cooked and completed. Our app will also have the ability to actively track the food a user has been eating and also spot trends in eating habits and suggest new foods by offering free digital coupons. This app can tell you whether or not you microwave is activated, what is on the microwave LCD, whether or not the door is open, give you information about the buttons and can let you know when your food is finished cooking. It can keep track of all the food you have consumed and the details about it. It also allows you to receive breakdowns about your meals and share this information with your friends and family, as well as giving you suggestions about what you should eat. You can also scan the barcodes on your food and the app will give you information about the food. Lastly, you can communicate information with your microwave. This technology should make cooking in the kitchen not only easier, but also safer. NukeIt+ will ensure you have perfect cook times chosen every single time. Cooking has never been such a breeze!